One of those things that nobody tells you when you start quilting is how important the right foot is. When I started, I just figured that the foot that came on my machine was an exact 1/4” foot….when really the foot that came on my machine had a seam allowance from the edge to the needle of 3/8”. It doesn’t sound like a big difference, but believe me…when your making a log cabin block or anything with a lot of piecing…your finished blocks end up way smaller. The one on the left came on my machine (a Bernina), the one on the right is a 1/4” patchwork foot I bought with a handy guide on the side. The stitches down below show the difference….the left is the 3/8” seam allowance, and the right seam is the exact 1/4” allowance. Pretty big difference huh? Anyways…the point is, that most machines come with a foot with an allowance of 3/8” and not 1/4” like many believe. So when your making a pattern that calls for a 1/4” seam allowance, you might end up with some small and un-matching blocks and seams if you’re not using the right foot. I know this from experience(s)(s)(s). P.S. For a long time I compensated for not having the right foot by bumping my needle position over to the right a couple of spaces. On my machine I could bump it from a O to a 2 and it was an exact 1/4”. But..make sure you measure the needle settings on your machine before you try it. My 1/4" foot is actually inaccurate (!). I learned that one the hard way. Sometimes when I'm feeling lazy, I just do my quilts with the larger seam allowance. It works out fine if you plan for it and keep it consistent. I do need to get an accurate 1/4" foot. Thanks for the reminder!! I have to admit – when you said "pound a bag of Doritos" I laughed out loud. I love it! I too did this same thing…what an idiot was I, my machine even came with the 1/4" foot! (also a Bernina) I LOVE that foot, it helps keep everything straight too while pounding the Doritos! I love my number 57 foot. Can't sew a decent seam without it. Until I got my Juki that came with a 1/4" compensating foot, I just assumed my regular foot was 1/4". I am so glad you put this out there! I could have put it on my blog, but it would only have helped about 3 people- ha! So true about the correct foot. When a quilting pattern calls for 1/4 inch seam allowance it is actually a "scant 1/4 inch". This is to allow for that little fold you get when you open up the piecing and press your block. With the scant 1/4 inch- once you open and press you should have a true 1/4 inch. well that was a great tip to share with the blogging world however my burning question, the thing I would most like a tip on is….HOW ON EARTH do you pound Doritos without having little orange finger prints on everything?!! So far the only solution I've found to this problem is to simple trade out the Doritos for a box of animal cookies!! i just bought one for the first time and i think it is making a big difference in how things go together. What a coincidence as i have just ordered a 1/4 inch seam foot for my machine!! I'm hoping it makes life easier, oh and more professional looking on the pieceing front!! 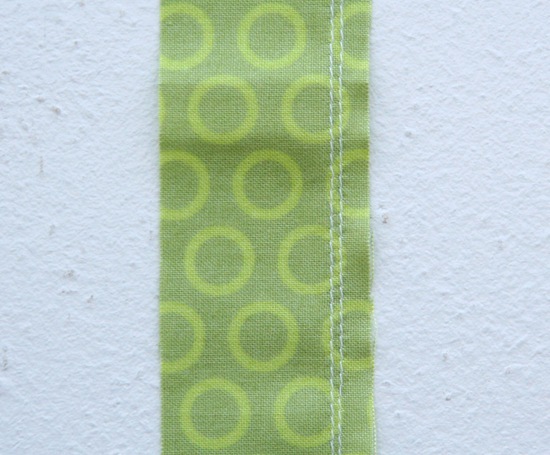 I bought the Huskvarna quilting card–the scant 1/4" seam stitch is my fav-or-ite. But I keep buying feet. Just got the 1/2" bias binder. It needs babysitting, and I wouldn't use it for something really important, but I can bind a whole very large baby quilt in 1.5 hour–including making the binding strip! I too found this out the hard way. I'm still "roughing it" by just moving the needle over. Halarious "pouding doritos" LOVE it!! Answer to Keriann above: you eat doritos with a spoon. Seriously, my friends and I eat Cheetos (our preferred orange-y goodness food) with a spoon. It looks weird. But it keeps those fingerprints off the fabric! I just use a piece of tape on the machine base to get an accurate seam allowance. Thanks fo letting me know it's OK to eating while quiliting. I thought it was against the rules. Doritos huh? ; ) I was a needle bumper too and that worked… until one day the kids changed the button on me. So like you said test. Test before you strip piece a whole pile of blocks. Test people. Or get a 1/4" foot with a guide on it. I am so glad you posted this. I've always thought my machine was defective. I kid you not. I learned that the hard way too. I felt silly when I finally took a quilting class and she explained the importance. I love my 1/4" foot now! My new machine came with a 1/4" foot for piecing and it hardly ever comes off now. It's such a great tool! 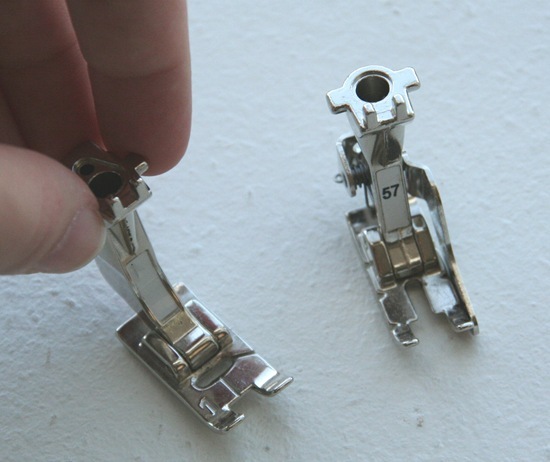 I had this same problem with my Brother but thankfully the used Bernina 1260 I bought already had the 1/4 inch foot. Great illustration of the difference in seam allowance! You're right, it makes a huge difference! I totally had an "ah ha!" moment when I read this post. So THAT'S why my stuff always comes out smaller then it should. I went out this afternoon and bought the 1/4" foot and I can't wait to put it on! Thanks for sharing this! I bump my needle over! I used to have 1/4" marked on my foot, and that was too hard to watch. So far moving the needle over has worked (I measured). Genius! Here I was thinking something was wrong with all of my measurements for my last three quilts, I'd never followed a pattern before so I'd never noticed. I think I should reacquaint myself with my sweet machine and her tools. Two more unconventional tips on this topic. 1. If you can't get a 1/4 inch foot, measure 1/4 from where your needle is and mark a line with a piece of masking tape. A big piece. This can serve as your guide. 2. Eat the Doritos and all chips with chopsticks! I "eye balled" a 1/4 of inch seam for years. I love my 1/4" piecing foot, I wish I had bought one years ago. I'm pretty new to sewing so I thank you for this b/c I had no idea! I am working on my first quilt (still cutting out the pieces) and this is great to know before I start sewing! Thanks!! Yeah, I, too, had multiple "experiences" before I figured it out…I thought everyone knew it but me, tho! Sometimes common knowledge isn't so common, so thanks for the reminder! I have a 1/4 foot with the guide too, it's a wonderful thing. I'm not exact by nature and need all the help I can get. I am just a novice quilter/patchworker. I need to buy another sewingmachine, mine is used . I want to buy a BERNINA too.I LOve to hear waht's your experience with this machine. this small post was worth its weight in gold! thank you! Thanks! That never occurred to me before. Is the Nr. 57 foot sold by Bernina stockists too? I have a Bernina machine. LOVE! the phrase…"(with a handy guide on the side so you can pound a bag of Doritos and sew at the same time)." Well, the #57 foot with the guide isn't fool proof, as I've found out. On mine, the guide is too far from the edge of the foot, and I get over a 1/4", so I still have to move my needle to the right 1 "notch." The hard part is when I turn the machine off and forget to reset it when I come back. Also, I have 2 Berninas, an old 931 and a newer Activa 145, and they use different feet due to different shanks, and they are not the "same" 1/4", so I have trouble if I switch machines while working on the same quilt. Does anyone know how to adjust the depth of the 1/4" seam guide? ?